In 2009, we sent 10 Halloween makeup kits to a lab to test for heavy metals. We suspected these products could contain heavy metals due to the substantial pigmentation in the products. Very sensitive tests revealed low levels of lead in 100 percent of the products. Further, half of the products contained chromium, four contained nickel and two contained cobalt. We were most concerned with the presence of lead in the products, because this metal is linked to serious effects on brain development, as well as cancer and hormone disruption. The CDC indicates that no safe blood level has been found in children. 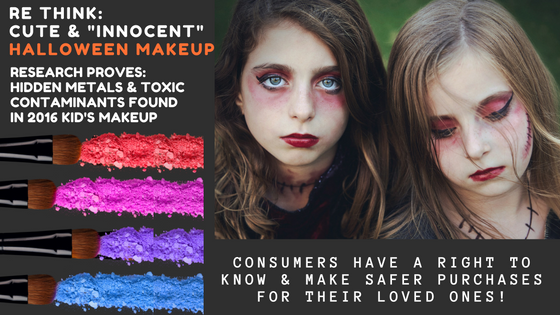 This year, we reassessed heavy metal contamination in Halloween face paints and also explored the presence of other chemicals of concern in makeup and personal care products sold year-round in toy aisles and stores marketing to kids and tweens. We’ve purchased 14 Halloween face paint kits, and we’re testing 48 individual crayons, and paints from these kits for levels of lead, cadmium, chromium, arsenic and mercury. In addition, colleagues from around the country have helped us gather more than 40 products from toy aisles and kids’ stores. We’ll be testing these products for styrene—a carcinogenic chemical sometimes used in fragrance and other ingredients. Why would these chemicals be in kids’ products in the first place? Many consumers become savvy label readers in order to reduce exposures to ingredients of concern, such as those linked to cancer, reproductive harm, or hormone disruption. These ingredients can be and are used in personal care products, as a result of lax regulations that allow almost any chemical to be used in cosmetics, shampoos, lotions and more. In fact, only 11 chemicals are banned from use in personal care products in the United States. In contrast, the European Union has banned 1100 chemicals. Labels do not tell the full story, for two key reasons. First, some ingredients can lead to contamination with other chemicals. Examples include ethoxylated ingredients, which can lead to contamination with carcinogens like 1,4-dioxane or ethylene oxide; and colorants and other minerals, which can lead to contamination with some heavy metals. Second, product labels can include the word “fragrance,” which may represent the use of dozens of chemicals, which remain undisclosed. The only way to know if products contain contaminants or ingredients of concern in fragrance is to send products to a lab that can test for specific chemicals, just as we are doing with these products. Stay tuned for results, coming in mid-October. Centers for Disease Control (2012). Lead: What do parents need to know to protect their children? Accessed 7 Sept. 2016 from: https://www.cdc.gov/nceh/lead/acclpp/blood_lead_levels.htm.